If you are looking for a free business email which is domain specific then here is one of the best choice available for you. Zoho Mail has free and paid versions. It`s free version is also interesting. 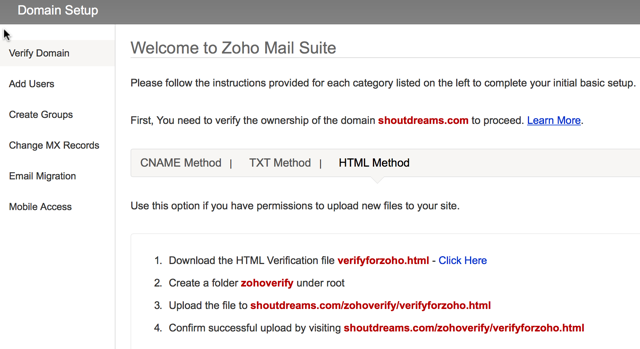 So today we will discuss about how to setup your domain Email address using ZohoMail. First of all you need to sign up for Zohomail. Click here to go to Zohomail link. Click on SignUp under FREE plan. Confirmation for your sign up for free lite plan. Click on “Proceed to verify domain ownership”. Verify domain ownership page will open. Verify with any of these options “CNAME or TXT or HTML file upload“. Now go to Zoho domain setup and finish the process. Zoho also offers mobile apps. So you should try ZohoMail to Create Free Business Email. If you are using any other service, do let me know via comments. If you like this article, do share it on Facebook, twitter or Google Plus. Don’t forget to like us on Facebook and subscribe eAskme newsletter for free updates..